Chicago Surprise is a card routine developed by Whit Haydn that substantially strengthens the impact of Chicago Opener / Red Hot Mamma. Considered by Haydn to be the strongest card trick he does, it's the opener of his act and apparently of the first tricks he teaches his students. 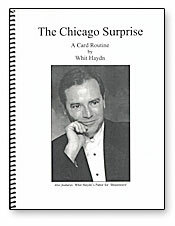 This 34-page booklet details all the ins and outs, psychology and theory of Whit Haydn's unique and very powerful version of the Chicago Opener.